Stole this design from Aga, whose work consistently blows me away! You can find her card here. Isn't it great? I used the same Altenew Invisible Alpha and changed up the background by using a circle stencil and gold Gouache paint. This was for my niece's college graduation. I just don't need many graduation cards, so I love to use alphabet sets for this purpose. Every time I see one of your fabulous cards I end up putting that stamp set into an order. This one is definitely on my list! you definitely should be happy about this card, Joan - it's wonderful! LOVE this card!! You are so talented! Such a cool, graphic look to this card, Joan! I love the addition of the gold dots! Awesome card. Great use of Alpha. Holy cow, that alphabet set blows me away. I had to go look at the set to see how it was accomplished. Very clever stamp design and I'm very tempted just because of the cool uniqueness of it. 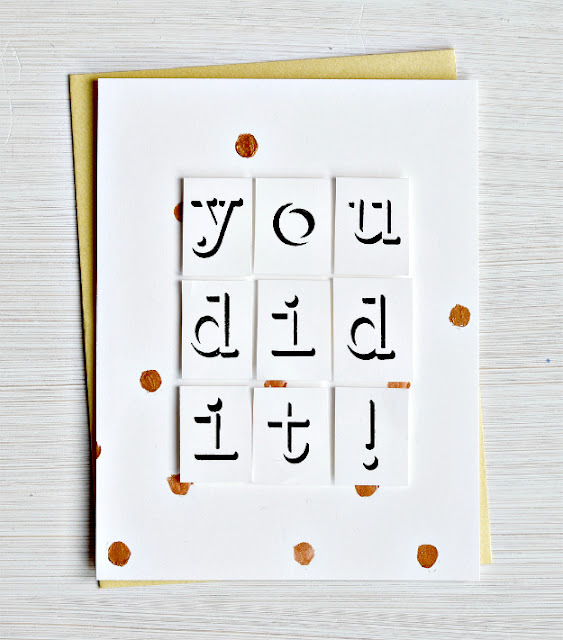 Your card is absolutely perfect for a graduation. You rocked me out from under my rock! Leave it to you to give me one of those Aha! moments. One doesn't need a special stamp for every conceivable time a card is needed. Use words with a unique background, and wala...a unique, one of a kind card is born. LOVE!! And yes, I, too, must have this alphabet set. Way cool!